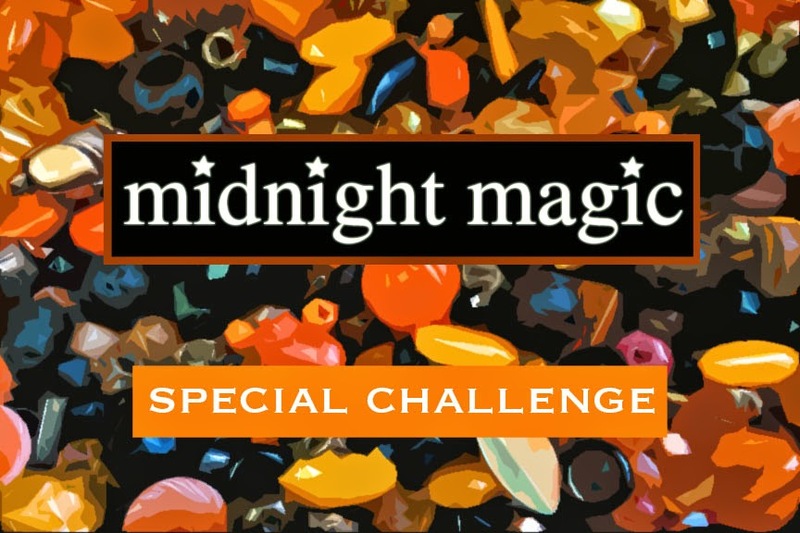 I'm super excited to see what everyone will create for the Midnight Magic Challenge! All the kits are now sold out and will ship out in the beginning of September! Many thanks go out to all those who purchased kits! Thank you! I was talking with a friend about how I've been bitten by the Halloween bug. Some years it happens... other years, not so much. This year, I've already been planning out projects and am excited to decorate the shop! Then we started talking about the kits and a lightbulb went on in my brain! Why not have a holiday themed challenge? What better way to really get in the mood for Halloween than a creative challenge? Usually, I've tried to steer clear of anything too literal, mostly aiming for unique color palettes and different points of inspiration. But I really wanted to embrace the season and have fun with a Halloween-themed challenge! Thusly... the Midnight Magic Challenge was born! The kit plays with traditional colors like pumpkin oranges, carbon blacks, aged coppers and includes several seasonally inspired components. To make it even more fun, I've decided to limit it to ONLY 13 (lucky) kits and have set the reveal date for Thursday, October 30th. Technically, this a pre-sale, even though I have already mostly selected everything. 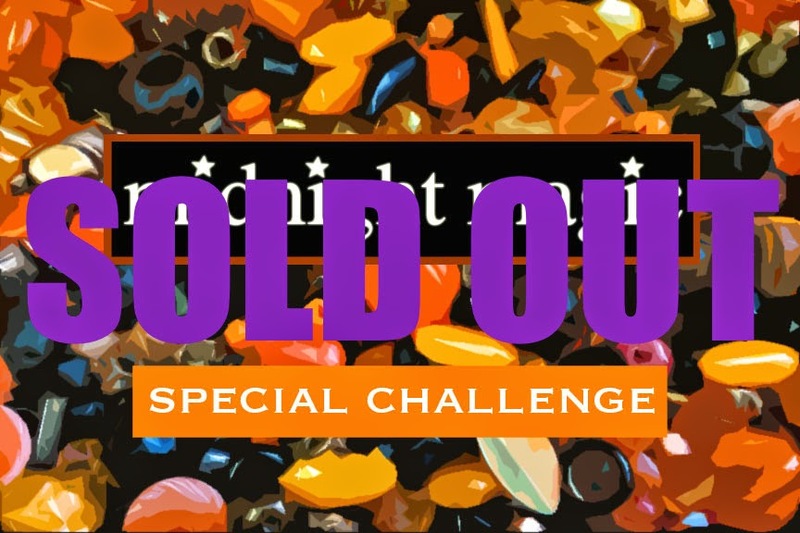 Before I post official pictures of the finished kit, I want to scout the upcoming bead show this weekend and see if there's anything special to add to the kit. I also have to make the Mystery Component. If you're interested in participating in this challenge, CLICK HERE. There are only 13 kits, so grab it while you still can! The kits will ship out in the beginning of September. It's not very often that I get two days off in a row nowadays. I usually find some kind of errand or task that must be taken care of with great urgency and that eats into my creative time. Fortunately for me, I had Sunday and Monday off! While I did have some things that I had to attend to, I mostly had time to make things... and make things I did! I made some polymer clay sugar skull ornaments/pendants. I made a set a few months ago and had many requests to make more! I'm parting with these guys for $25 each. 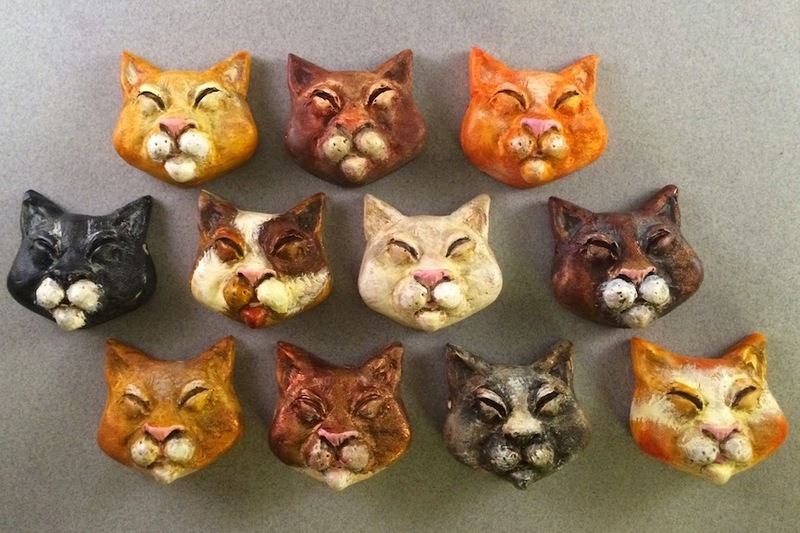 I finally cast the cat heads that I sculpted a few months ago, sanded them down, drilled them out, and painted the feline-themed beads. These beads are $18 each. 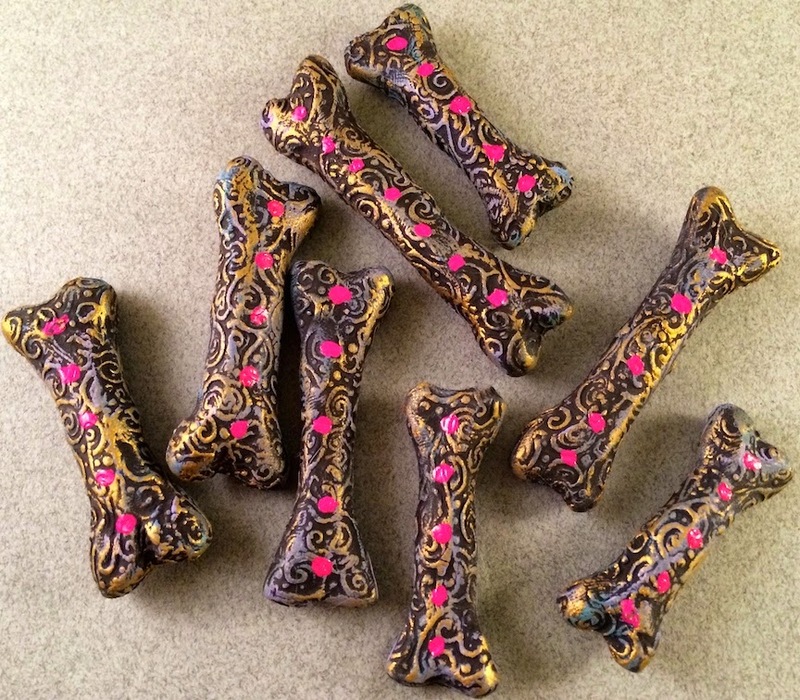 After I made the sugar skulls, I decided to make polymer clay "sugar bones" to match. They are drilled in the middle, from top to bottom, making the bones lay horizontally. These come with the sugar skulls complimentary. I also had time to try my hand at GlassClay. I was hesitant to try it out. The firing schedule seemed pretty daunting and an earlier experiment did not yield good results. 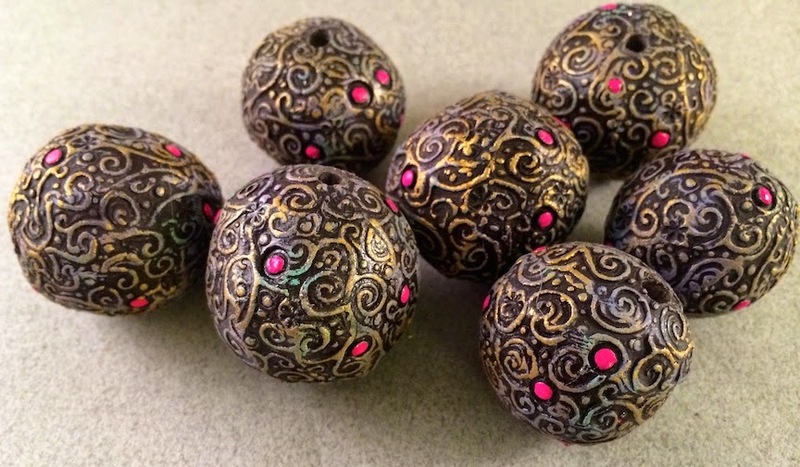 I tried it again and made these rustic-themed beads. I wasn't smitten with them, so I jazzed them up with a little bit of gold-colored heat-set paint. I even managed to make some more polymer clay beads. They're big! The seven that I made are pretty lightweight and easy to incorporate into a project. Today is the REVEAL of the Mystery Component for the Festival Lights Challenge. Up until now, only the participants of the challenge were privy to this information! The Mystery Component is a polymer clay pendant made by me. I wanted it to have the look of an old carnival ride, slightly rusty with faded paint. In the dark, the lights transform the rides into a wonderland of color and excitement! 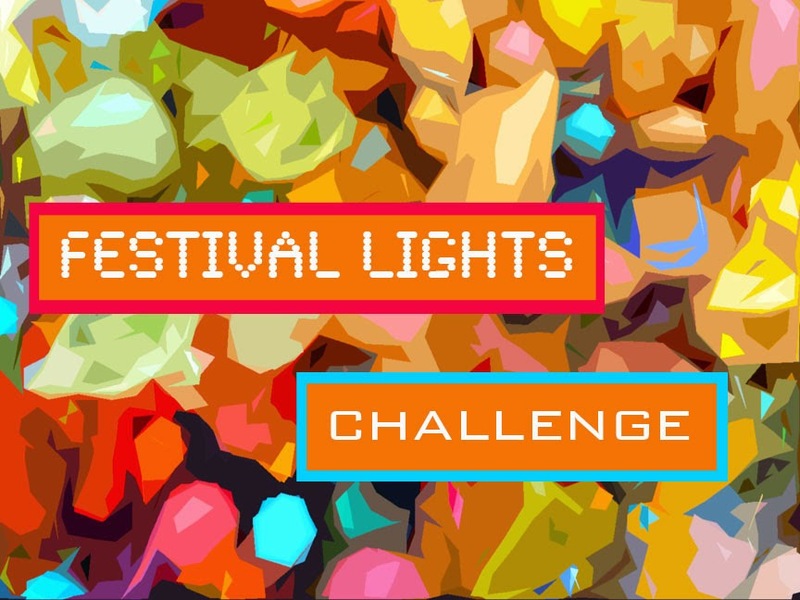 To find out more about the Festival Lights Challenge, CLICK HERE. And keep your eyes peeled for the Blog Hop Reveal where participants of the challenge will share their creations! The Blog Hop is scheduled for Thursday, September 18th. 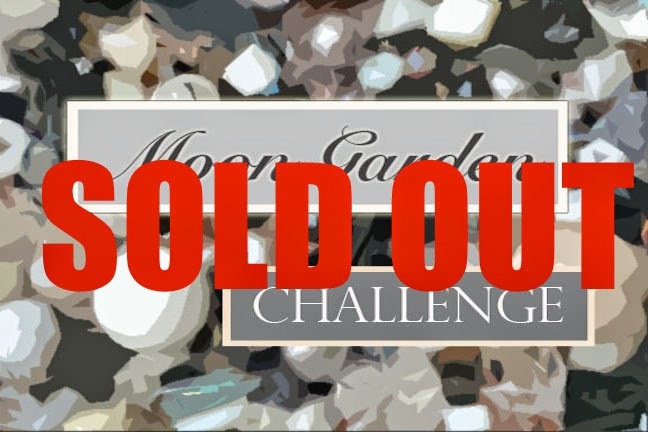 Many thanks go out to everyone who purchased a pre-sale kit for the Moon Garden Challenge! Thank you! The kits are now sold out and will ship in the beginning of September. I love the color palette of this challenge and am super stoked! I can't wait to see what everyone creates! Since we opened the store, I haven't been publishing as much as I used to. Even when I have the best intentions and actually make pieces for submission, they usually get shuffled to the bottom of the pile and by the time I remember their existence, I've missed my deadlines. 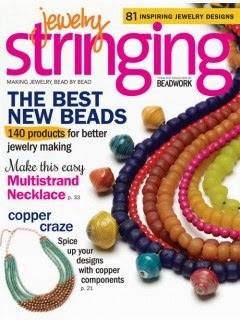 However, I did manage to squeeze in a bracelet and a pair of earrings in the most recent issue of Jewelry Stringing. 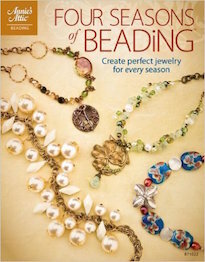 I have a soft spot in my heart for Jewelry Stringing. It was the first magazine that I submitted to and was published in... oh, ten years ago or so. When I look back at those old issues, I see how much I've grown and how much my style has changed. 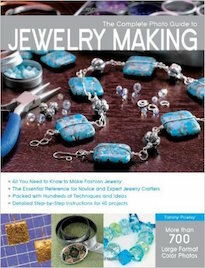 In fact, it seems like the whole jewelry world has grown along with me, because when I look at the magazines nowadays, there's a new level of sophistication and the technical skills included in the instructions have advanced so much. Even though things have progressed, the old issues still sparkle with inspiration and I love going through the back-issues and revisiting ideas and remembering all the friends and memories that I've made along the way. If you fancy the earrings that I made for the Fall 2014 Jewelry Stringing issue, I have the bronze skull charms available in the Allegory Gallery online shop. CLICK HERE to visit the link. I paired the skull charms with shibuichi earwires from Saki Silver, Swarovski crystal pearls in Iridescent Green, and tiny faceted iolite rondelles. 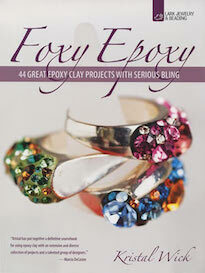 Check out the magazine to see the finished earrings and other great designs by a host of talented jewelry-makers! I've been super busy lately and have some big projects on the horizon. I wanted to give myself a little breathing room and decided to push up the release of the next kit: Moon Garden. I've been gathering up the components of the Moon Garden kit for awhile now and already have it mostly done. I just need to finish up the Mystery Component(s). I was inspired by natural moonstone and labradorite. I imagined an otherworldly garden where the alien flowers and lush flora were made up of these stones. It's a blend of pale peaches, cool grays, milky whites, and aged silver with pops of inky black. I smitten with this color combination. It's subtle and elegant, and is a great palette for fall, transitioning into winter. The tentative reveal date is scheduled for Thursday, November 13th! If you're interested in getting a kit and participating in the next challenge, CLICK HERE. Hurry though! Kits usually sell out FAST! PLEASE TAKE NOTE: This is a pre-sale and the kits will be mailed out in the beginning of September. Many thanks go out to those who participated in the Royal Feather pre-sale! Thank you! The kits are all sold out! If you're not familiar with the challenges, it's a fun and informal way to play, create, and challenge yourself with a pre-selected set of components. Although all the kits have been sold out for a few weeks now, I wanted to share what is included in the Royal Feather Kit. I'm super excited to see what everyone who got a kit will make! To participate, challengers had to order a Design Kit. This kit features a selection of premium Czech glass (both vintage and new), vintage lucite, vintage Japanese glass, vintage French seed beads, Chinese crystal, decoupaged bamboo beads, African glass, vintage Hamilton gold, and banana leaf covered bamboo beads, and Irish waxed linen. The kit also includes a Luxury Bead Blend. The Luxury Bead Blend consists of Japanese Miyuki seed beads, Toho seed beads, Matsuno seed beads, Czech glass, charlottes, semi-precious stones, Swarovski crystals, antique Venetian seed beads, French seed beads, vintage sequins, vintage Japanese glass, glass pearls, and freshwater pearls. But wait... there's more! The pictures show a lovely mix of materials, but what isn't shown is the Mystery Component! Each kit will come with a special, handmade component that will remain a mystery until it arrives at their doors! 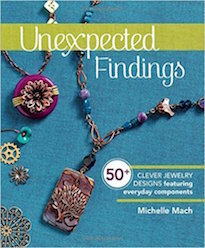 The Mystery Component might actually be more than just one bead or pendant! It's a surprise! The Mystery Component will be publicly revealed on Monday, September 15th! Participants will have approximately two months to work on their projects. In selecting the components for this challenge, I imagined a fan of peacock feathers in jewel tones. I wanted to blend verdant greens, regal blues, and luscious purples with pops of aged bronze and burnished golds. With the kit, using as much or as little of it as one likes, participants create a piece that showcases their creativity, individuality and artistic expression. Ideally the creations will spotlight the gorgeous selection of beads included, but the sky is the limit with one can use and create! The reveal date is set for Thursday, October 16th. Post a picture on your blog or send one to me to post on your behalf (if you don't have a blog of your own). 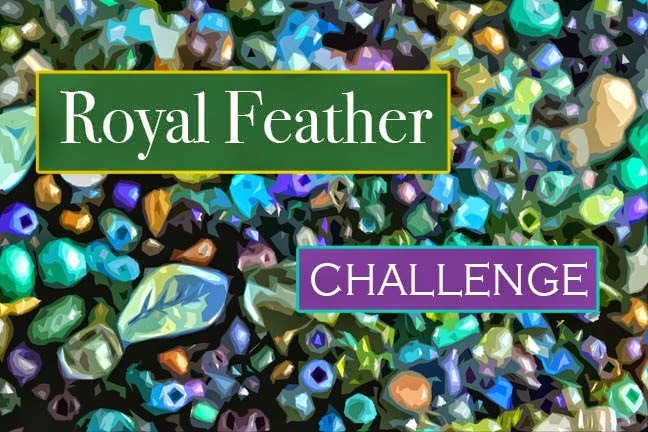 The Royal Feather Challenge will end with a blog hop, sharing all the amazing creations with your fellow challengers! There were only 20 Design Kits available, with one set aside for myself! The Design Kits will be shipped out Tuesday, August 19th via Priority Mail. Thanks again for purchasing the kits via the pre-sale! And keep your eyes peeled for the Reveal on October 16th! The next kit that will go on sale is Moon Garden! Moon Garden will be available for pre-sale tonight at 9PM EST. Beneath the branches, resting in the cool, dark shadows: cobwebs bejeweled with dewdrops and fallen flowers. After the rain, before the sun, an ephemeral tableaux – only in this fleeting moment. 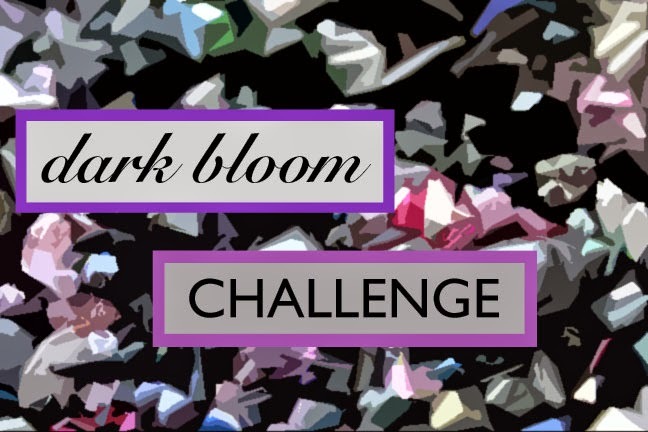 Today is the Reveal for the Dark Bloom Challenge! If you're not familiar with the challenges, I put together a Design Kit and offer them on a first-come, first-serve basis. Challengers claim their kits and then I send them off around the world! Each participant has about two months to create a piece and at the end of the challenge, we all share what we made! It's a really fun way to challenge your creativity and it's always interesting to see what will spark someone's imagination and pique their creativity! Sometimes there are common themes and then other times, things are wildly different! This is a snapshot of the kit! It included lots of goodies! I added lots of Czech glass (both new and vintage), hex-cut Japanese seed beads, hematite, iron filigree, African glass, lampwork glass, waxed linen, vintage lucite, and a gunmetal toggle. 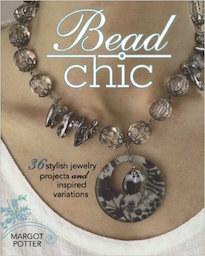 Plus, a Luxury Bead Blend! Participants could use as much or as little of the kit as they liked! They could also incorporate their own beads! Here's a close-up of the bead blend! It's a random assortment of all kinds of pretty little beads in purples, charcoal, blacks, and grays with pops of fuchsia! I used a blend of Czech glass, semi-precious stones, Swarovski crystals, different kinds of Japanese seed beads, and so much more! The kits included something else too! Each kit came with a Mystery Component! This time around it was a polymer clay pendant by me! I carved a mold of a stylized Ancient Roman flower pattern. Crystal Lombardo Farrell made this necklace. 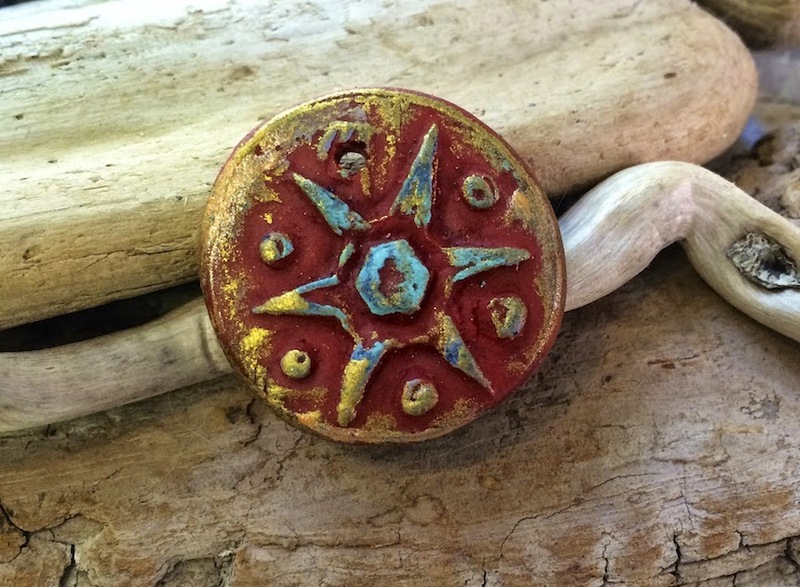 Here's what she had to say about it: "I've had this pendant that Andrew made for a little while now. I love it because it's both so beautiful and so bizarre. 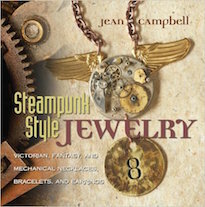 I have tried a few different designs for it because it is clearly too special to just put on a chain, but none seemed to do it justice. I added some beads from the kit along with some others I had, and tried to keep it asymmetrical but sill harmonious. 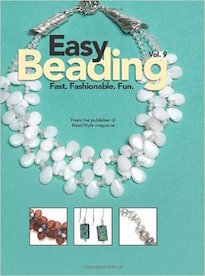 I intend to keep this one for myself and wear it, so I used smaller beads in the back so it wouldn't tangle in my hair." Laurel Ross made this necklace. Here's what she had to say about it: "I saw a design on Pinterest with a similar concept and decided to take it to next level! 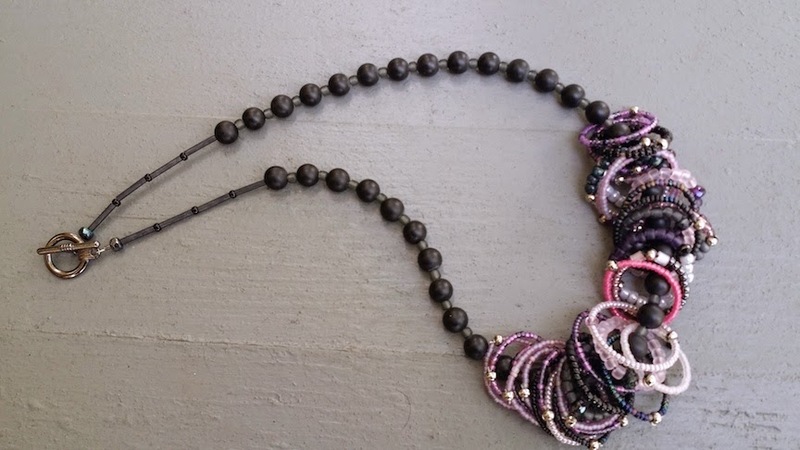 I used beads from the Dark Bloom kit and leftover beads from the Radiant Orchid kit to create beaded loops that I strung on a beaded base necklace. It has a lot of fun movement!" 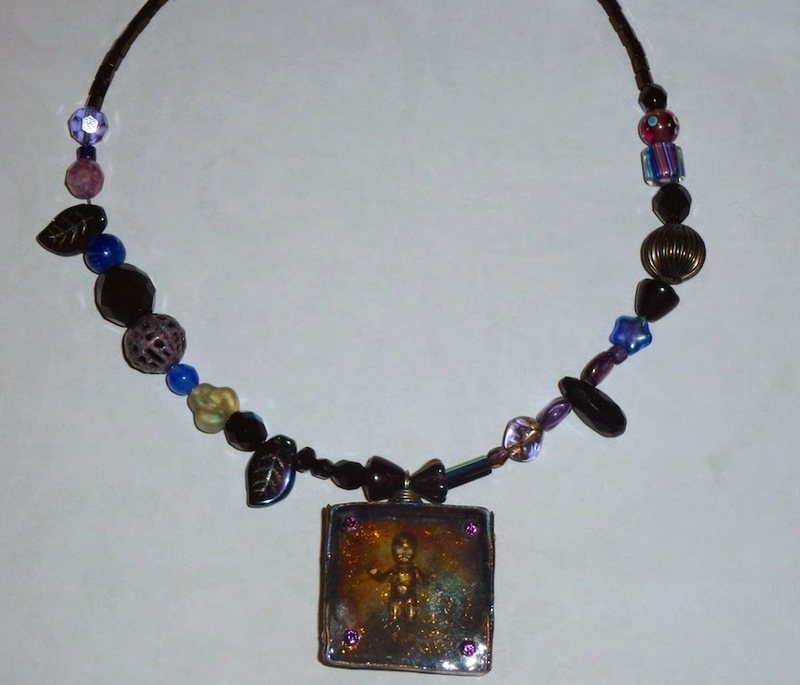 This necklace was made by Geri Colgrove. Here's what she had to say about it: "I call this piece Midnight Elegance. I used most of the kit to create the wire-wrapped link chains, plus I made a fabricated metal and resin focal. I dangled knotted waxed linen from the base of the focal." This bracelet was made by Alison Herrington. Here's what she said about it: "This piece is made entirely of beads from the kit! I used a knotted waxed linen technique from Lorelei Eurto to make this braided bracelet." This bracelet was made by me. 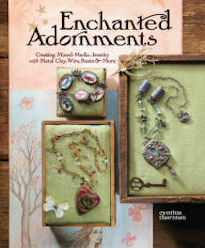 I used a technique from "Jill Wiseman's Beautiful Beaded Ropes: 24 Wearable Jewelry Projects in Multiple Stitches" book. It's a spiral stitch that's embellished with peyote stitch. It has a nice studded look, almost as if it were speckled with dewdrops. I also used the polymer clay focal as a dangle and used the corrugated iron bead to visually beef up the point of connection from the toggle loop and the base of the bracelet. But wait... that's not all! Please swing by the blogs of the other participants from around the world! Check out what they made for the Dark Bloom Challenge! The Festival Lights Challenge is up next! The Reveal is scheduled for Thursday, September 18th. Check back here to see all the lovely creations! 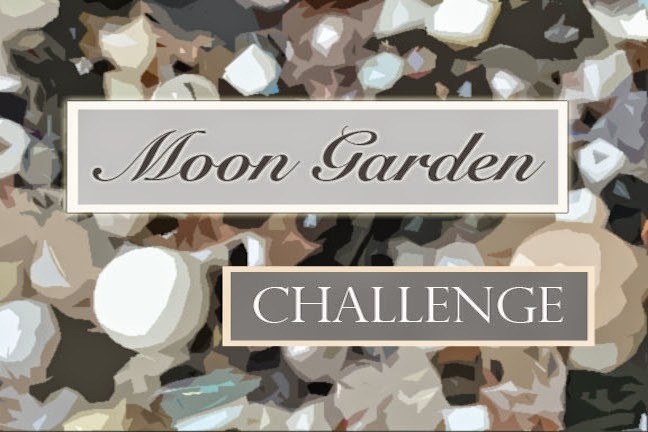 Also, tomorrow (Friday, August 15th) the Moon Garden Challenge kits will go on sale! Swing by tomorrow and get ahold of your kit! If you're interested in participating, the kits sell out super fast!! So make sure to grab one while you still can! I'm looking forward to tonight! Cynthia's show opens at the gallery and I'm very excited. I love all the pieces. They're simply magical. 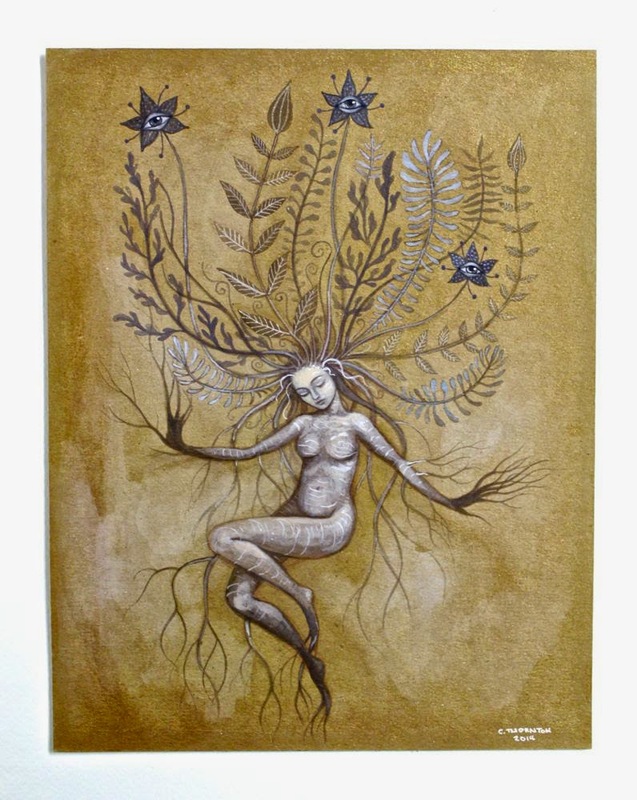 This is Cynthia's second solo show at the shop and will feature twelve new pieces. Each of them is enchanting! The opening reception is from 5PM to 8PM. I hope you'll get to drop by and see the pieces in person! If you're not able to attend, you can still see the show online! CLICK HERE to check out the pieces from the exhibit. 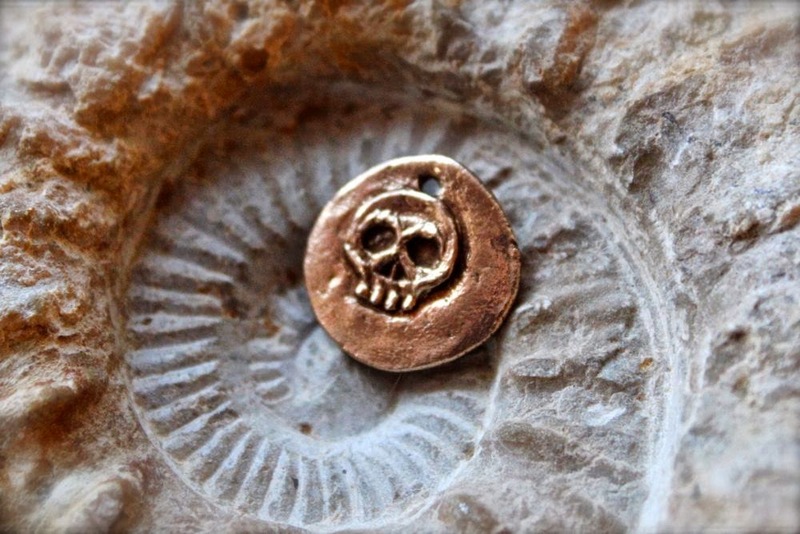 And if you become smitten with anything, you can purchase pieces online too!